I have provided information on the five major certifications applied to coffee: organic, Fair Trade, Smithsonian Bird-Friendly, Rainforest Alliance, and Utz Certified. Starbucks does sell certified organic and Fair Trade coffees. You can see how much coffee they (and other major companies) purchase and how much is eco-certified in this data table, which is kept updated. 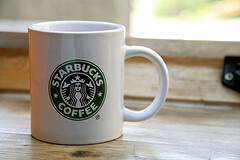 Starbucks also has its own green coffee sourcing standard, known as CAFÉ (Coffee and Farm Equity) Practices. It was developed in partnership with the non-profit environmental group Conservation International and SCS Global Services. (SCS), an independent evaluation and verification company. The CAFÉ Practices program covers four categories. Two, product quality and economic accountability, are criteria that are required by all Starbucks suppliers. The other two categories are social responsibility and environmental leadership. I’ll focus on the environmental criteria. A point is awarded for compliance with individual “indicators.” In the current version, there are 185 total indicators for large suppliers (greater than 12 ha) and 124 for smallholders, including those who are part of a cooperative. In the section “Coffee Growing — Environmental Leadership” 45 points are possible (42 for smallholders). Many of the individual indicators are actually multiple variations on the same criteria; only one of them can be counted for a point. For instance, the indicators dealing with organic mulch award a point for either 25% of the production area being covered by organic matter, 50%, or 100% — three indicators but only one point possible. The “Coffee Growing — Environmental Leadership” section covers water body protection, including criteria for width and type of vegetated buffer zones along permanent and seasonal water bodies, and use of chemicals or waste storage near water bodies; protection of soil resources, including measures to control and prevent erosion and use of organic mulches and cover crops; conserving biodiversity, including maintaining a shade canopy, protecting wildlife, and establishment of conservation areas; and environmental management, including pest and disease control. There is an additional section that deals with environmental issues having to do with coffee processing, specific to either wet processing or dry processing, which includes indicators on water conservation, waste management, and energy use. This particular subsection has three indicators that are mandatory: 1) native trees are only removed if they are a hazard to people or “significantly” compete with coffee plants, 2) hunting or commercial collecting of flora or fauna is prohibited, and 3) no conversion of natural forest to agricultural production. Indicators specific to maintaining shade cover include percent cover, canopy tree diversity and native species benchmarks, and preservation of epiphytes and vines. To compare Starbucks CAFÉ Practices environmental criteria with those of Rainforest Alliance would probably take sitting down and mock-scoring some imaginary farms. I suspect that a farm meeting Rainforest Alliance’s minimum environmental standards would turn out to be using more sustainable growing methods than the typical Starbucks preferred supplier — although a lack of standardization among the standards might make that assessment difficult (Rainforest Alliance uses 99 criteria in 10 principals, with percentage thresholds for certification). It also wouldn’t surprise me that a Starbucks strategic supplier that scored highly in the Environmental Leadership sections could beat out a Rainforest Alliance-certified farm. Because the Smithsonian Bird-Friendly biodiversity criteria are so well-developed and targeted, and since their certification also requires organic certification, their environmental standards are the strongest. Overall, I’m generally impressed with the scope and level of detail of Starbucks CAFÉ Practices environmental standards, and find them superior to those of some highly-regarded certifications. There have been accusations that the reality on the ground with some Starbucks suppliers is inconsistent with CAFÉ Practices standards. In some cases at least, that is true, but it is also true with other certifications; Starbucks tends to receive a lot of scrutiny. Third party verification systems are subject to the same corruption and deceit whether they are certifying organic products or Starbucks coffee. There are plenty of places where compliance can break down, and that’s the topic of a separate investigation. To examine all of the Starbucks CAFÉ Practices criteria yourself, download the standards documents which are available online at the SCS web site. You can also download current and past Global Responsibility reports at the Starbucks website. This post discusses how the CAFÉ Practices program is assessed and its impacts. In May 2015, I wrote an overview and update on Starbucks CAFÉ Practices for Daily Coffee News — read it here. Starbucks coffee cup by Rudolf Schuba under a Creative Commons license. Julie, I have immense admiration for the zeal with which you undertake work that most coffee buyers, even from the most-respected companies, have never done! Likewise, your perspective on biological and environmental sustainability is invaluable to people like me who see a lot of coffee farms but have no background in assessing healthy ecosystems. I tend to agree with you that because Starbucks "tends to receive a lot of scrutiny", C.A.F.E. Practices gets less credit from consumers than it probably deserves (it's also kind of confusing, with the 60% an 80% thresholds). I'm not saying it's perfect (it's a certification, after all!) but we purchase coffee from a number of co-operatives and independent growers which have obtained C.A.F.E. Practices certification and I always consider it to be a positive indicator. Usually, certified farms are more organized and keep better records than comparable, non-certified farms. Thanks for your thoughtful analysis and comparison! KEB — you know that means a lot to me coming from you. Thanks! San, you made my day. I’m glad I could help; let me know if I can point you to any other resources. There is something that is not really clear for me: which organization is verifying C.A.F.E. Standard? The CAFE Practices standards are verified by the same types of certifying bodies as organic certification (often, the same organizations). A list of approved certifying agencies can be found on the Scientific Certification Systems (SCS) web site. Is Scientific Certification System a credible verification although it is payed by the company that certifies? How does people perceived SCS? SCS isn’t a “verification,” it is the company that helped Starbucks — as well as many other companies in many industries — develop their standards. It is a well-known and respected company. They also provide the certifying organizations with the guidelines to be able to understand the CAFE Practices standards so that they can be approved to verify them. SCS does not do the verifications themselves. They are done by approved certifying organizations located all over the world; local organizations are used to reduce costs to the producers. It’s the same way that organic certification works. I am Senior Manager Sustainable Management Services for Ecom Gill Coffee Trading Pvt Ltd in India. We have certified farms for Rain Forest Alliance , 4C , UTZ & right now we are in the process of certifying for Nespresso ‘AAA’ programe. Can you let me know how to go about certifying our farms for Cafe Practices as we are getting a lot of enquiry for Cafe practice coffee.